We're on the last week of school holidays here. The weather has been fantastic - up until today - so there's been no cabin fever to speak of so far (although rain is scheduled for the rest of the week, ack!). It's been wonderful to enjoy a peaceful morning without the usual early morning herding of boys into their day. "I said a QUICK shower!" or "Eat your breakfast, mate." or "Can you stop worrying about your phone and just pack your bag, please?" and finally "If you don't hurry up, you'll miss the bus - and I'm not driving you!" So it's nice to sleep in a little... and not be the Dragon Mother. I've managed a couple of mornings sleeping in until the positively decadent time of 8am. Score! So what have we done instead of school? We've had friends of M's here for sleepovers, we've gone to the park, and we've trotted off to the movies. H and I went to see 'Pirates: Band of Misfits' last week made by the same clever people who brought us Wallace & Gromit. H thought it was hilarious, laughing loudly several times throughout. I did too, although some of my giggling was at different parts of the movie. You've gotta love those film makers who include a few jokes for the grown ups, don't you? Today has been quite different. My eldest two boys are working and H is at a friend's house for a sleepover. So I've been home alone. ALL DAY. It's felt quite odd without anyone here during school holiday time, especially H. I'm so very used to hearing his deep voice in the background, rattling off huge chunks of memorised dialogue with its trademark low hum, or hearing the clatter as H builds a massive robot out of Hero Factory Lego on the lounge room table. I know he will be having the BEST time ever at his friend's house so this odd feeling like I've forgotten something is a small price to pay. It seems my boys are growing up. When did that happen? So what have YOU been doing over the school holidays? 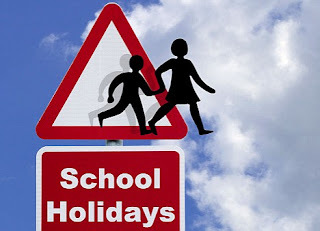 Are your children back at school? Or if you're child free, what would you RATHER be doing right now? I had my eldest home for the first week of holidays along with Boo. Then the second week I had everyone home with the flu. Right now I am sitting here all alone in the silence and it is FABULOUS! I have only had one night ever without Boo home and it was eerie... you do notice the lack of their low level noise. I hope you enjoyed your day alone. It's like Dale Kerrigan says in 'The Castle' ... "How's the serenity?" Hee. The rain has well and truly set in here but the boys are quite happily playing at the moment. I definitely enjoyed my quiet day yesterday though - managed to watch the first two episodes of the new season of Mad Men! Win/win! Hope everyone is now well at your house, Kelley. Thanks for stopping by! I remember a guy looking in to my pram with Eldest Son lying there - he was four months old at the time - and saying, 'They grow up so fast,' and I thought, 'Yeah, yeah...' Hello? Was he right or not? My eldest is 10 now. Double digits! And getting more and more independent by the minute. Just like you, I've enjoyed some sleep ins. We've also hit the indoor pool a few times. The boys can swim, I can watch and read and they get worn out. You know how it is with three boys...they need exercise! My eldest is 23 and it literally feels like yesterday when he was a little boy. I look at him and the traces of that little boy is still there, just covered over by all this 'grown-up' stuff. Double digits are a big deal for kids, aren't they? As is the entering of the teen years... my youngest will reach that milestone next year. I'm steeling myself for the bittersweetness of it all!